Also available as a Deck/Book Set. Companion book is also available as BK161. See also: Halloween Playing Cards. I need to begin this review by saying that Halloween is a favorite holiday of mine. I like dark and creepy things. A tarot designed with Halloween images had to live up to an expectation of what I see in the holiday -- the fun and the serious, the comic and the dark; a combination of horror and delight; a mixing of old history and new customs. Plus, it needed to speak to me, through its art and words, and most importantly still, through the readings done with the cards. 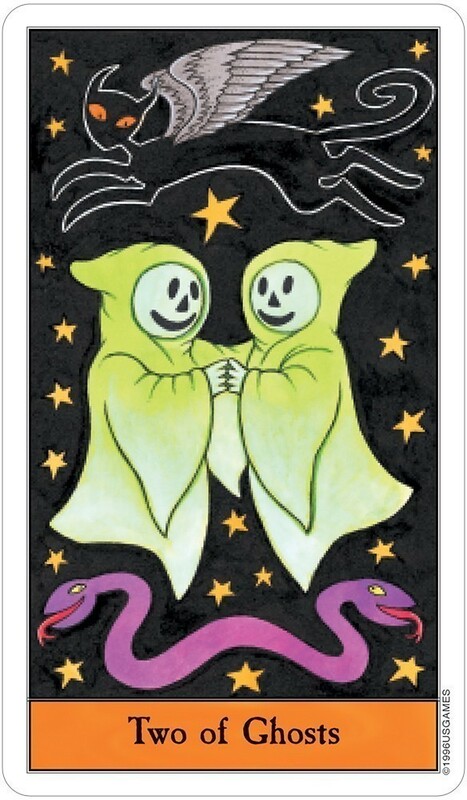 The artist and the author are both also great fans of Halloween, and they have indeed created a terrific tarot deck in honor of this black and orange holiday. The set exceeded my expectations of it, despite my quirky requirements. All of the artwork is consistently very good, and the deck feels complete. After I read the book and studied the cards, I was ready to do some actual tarot work. Not to sound overly skeptical, but I wondered how the images would speak to me in readings, as they are designed around Halloween. Generally I don't do very in-depth readings when I first try out new decks. I give them a chance to sort of introduce themselves to me. But, for whatever reason, I felt moved to go into some detailed queries with these cards, and was surprised to see very accurate and somewhat uncanny results. The Halloween images did not get in the way of reading the cards in a traditional manner, in fact, they spoke to me as well as any other tarot. The set obviously won't appeal to everyone. Not everyone likes Halloween, or will like the style of the artwork. Also, it's a dark deck -- in color, and features many skulls and spooky grinning faces. But, I do highly recommend the set to anyone who feels drawn to it, enjoys Halloween, or even just wants a very fun but useful deck for Halloween parties. I love Hallows. I love the depth of magic that is woven as the veil thins and the serious, introspective work that is commonly undertaken at Samhain. I love the festivities of Halloween -- the costumes and candy and the prominent and often positive images of witches, black cats, cauldrons, and brooms. 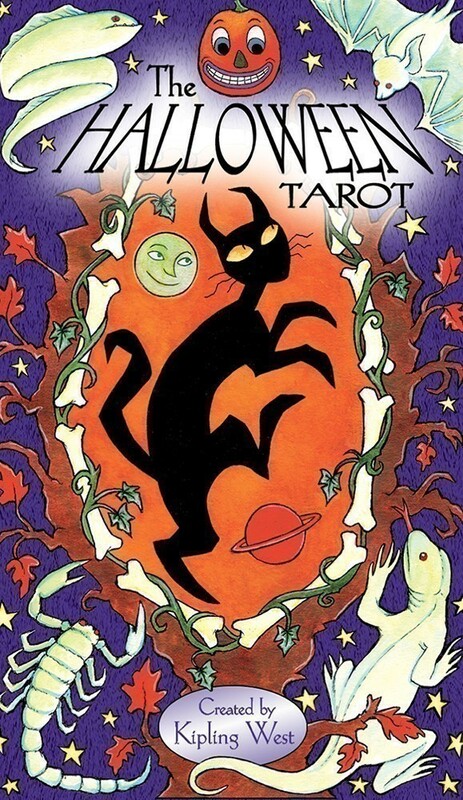 Not surprisingly then, I loved The Halloween Tarot, by Karin Lee and Kipling West. 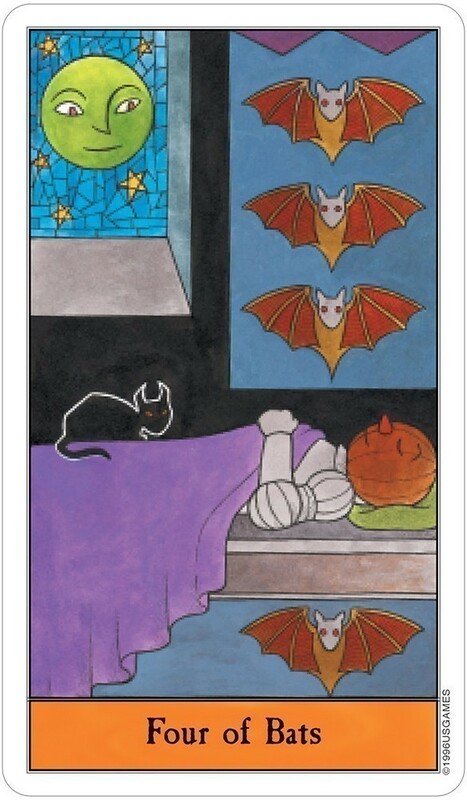 This deck is a Rider-Waite-Smith clone, in that the illustrations are closely based on the RWS deck, but the traditional images have been halloweenified. The Emperor and Empress become Frankenstein and the Bride of Frankenstein and the suits of pentacles, swords, wands, and cups are transformed into pumpkins, bats, imps, and ghosts respectively. The traditional aspects of the cards will appeal to readers who want to work with RWS, while the clever, colorful, fun, Halloweeny aspects will draw readers who dislike RWS or consider the images to be archaic, rigid, or flat. 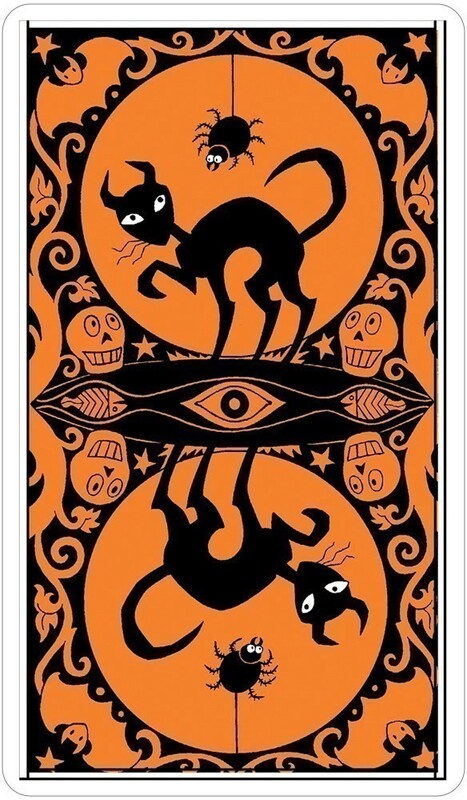 Unlike the RWS deck, every Halloween card includes a single black cat. 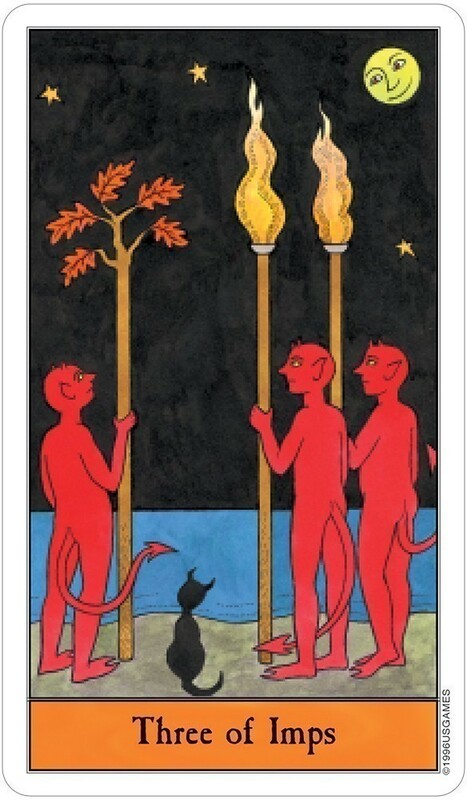 This cat, whose image graces the reversible backs of the cards, begins the Major Arcana as the Fool's companion and ends up as the center of The World. The cat's presence unifies the deck, pulling together this diverse collection of Halloween lore, and the cat's animated facial expressions provide another layer to the cards' imagery. It captures the fun of Halloween without the darkness or seriousness of Samhain. 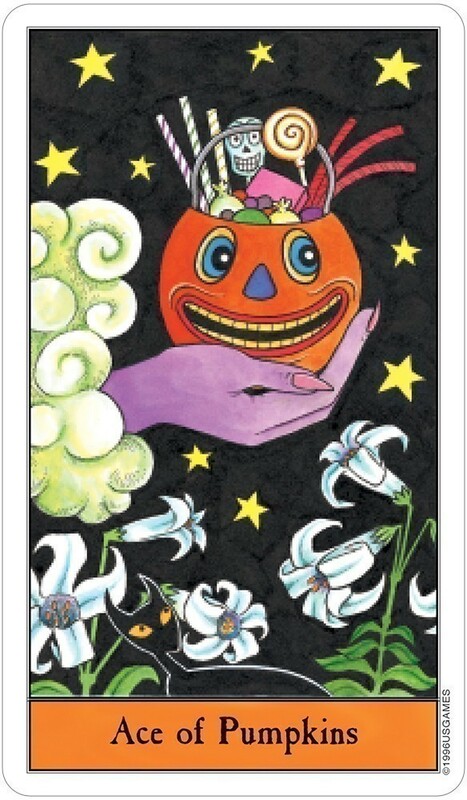 Even the Death card, often the most frightening image in a tarot deck, is portrayed as a smiling skeleton who is lovingly watering a patch of jack-o-lanterns. Karin Lee explains that "rather than portraying Death as mysterious and threatening, this card reminds us that death is part of the natural process of life. I highly recommend this deck and book set for what it is-a RWS deck with a twist and a fun portrayal of the secular side of Hallows. This is a real Tarot deck with carefully thought out imagery based on the familiar Rider-Waite pack. 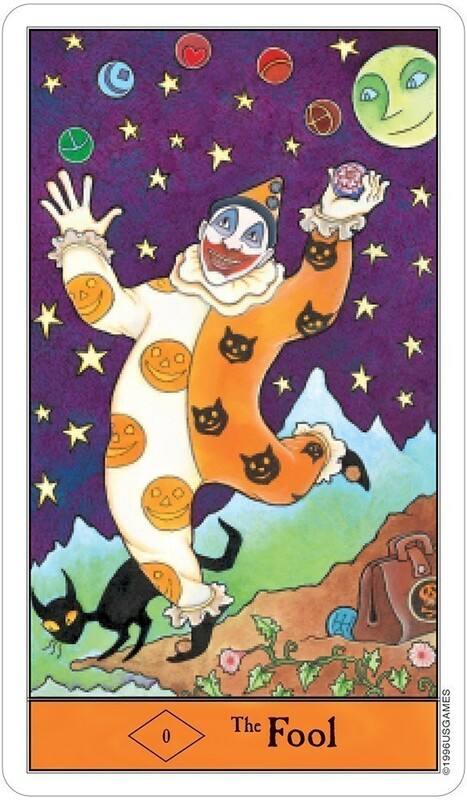 It has been delightfully "twisted, turned, and tweaked" to create a colorful, humorous, and fun-filled Halloween deck. The brief little pamphlet that comes inside the box with the "deck only" set explains that the imagery chosen by artist Kipling West incorporates not only old-time Halloween archetypes but characters from old horror movies, circus images and from the German-made Vegetable People that were popular decorations in America in the 1920s and can be seen on vintage Halloween postcards. Mixed in with the Halloween symbols is a blend of ancient Greek, Egyptian, Hindu, Chaldean and biblical imagery. Kipling West knows her Tarot and she clearly loves Halloween as I do. This deck is so much fun, the illustrations so bright and colorful and detailed that I think most any Tarot lover will find it enjoyable. It is perfect for light-hearted, less serious readings that might be done at parties but can also be used by the serious student to broaden one's understanding of the traditional Tarot symbols. 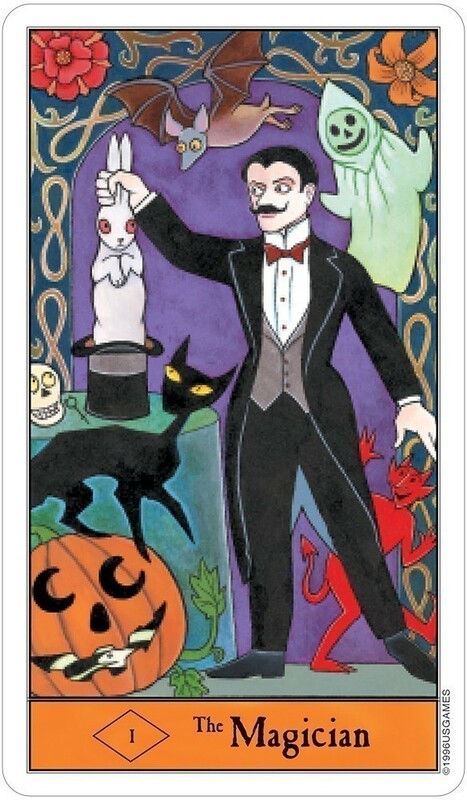 While the symbolism on the Court cards and the Major Arcana is very faithful to the Rider-Waite vision it is at the same time enormously creative in working the Halloween symbolism into the cards. The images are all fun and so they are useful for working with people that are merely curious because they do not frighten, however, an experienced reader can easily transpose their own deeper knowledge of the cards onto these loosely veiled images and the deck is satisfactory for serious divination. If you love the fun-filled and slightly freaky American holiday of Halloween with it's orange and black cornucopia of characters and symbols you will adore this deck as I do.